I find the debate over the "downtown interstate" issue interesting. Y'all bring Charleston into the debate very quickly, and understandably so, but you leave out the best example in the Carolinas of how NOT having a downtown interstate or freeway system can be successful: Columbia. Most people don't realize this, but Columbia has the second largest CBD in terms of square footage in the Carolinas right behind Charlotte. 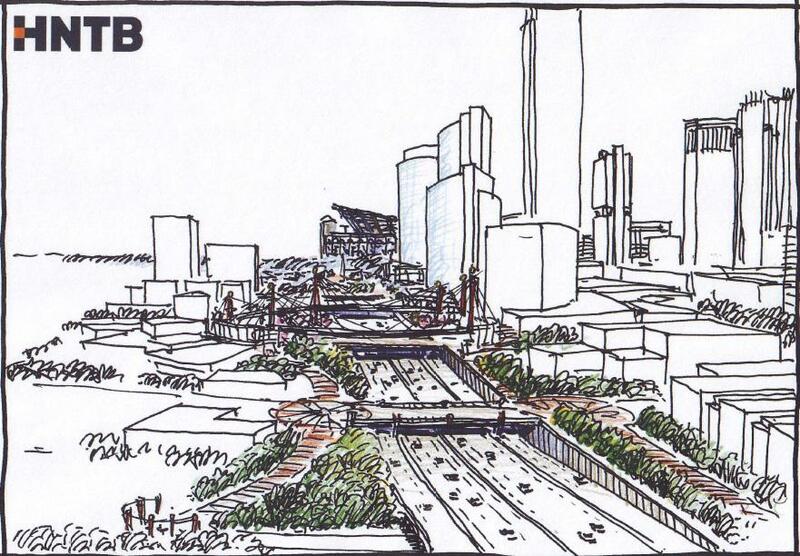 Columbia had the opportunity to install a freeway system that was strikingly similar to Charlotte's own 277. In Columbia, the only parts of it that made it to reality are I-126 and SC-277. These both act as major arterials funneling traffic to and from downtown much like Independence and Brookshire/Belk do for Charlotte. Columbia did not build its freeway system for whatever reason, and it still has a very successful downtown, even during the white-flight era. Its original downtown grid is largely intact, save a few railroad issues. The downtown is resurgent just like the other cities in the Carolinas. More important for this topic, however, the traffic flow is handled quite well by its grid system, and the lack of a freeway has not caused the CBD to die off. Charleston is a wonderful city, but its downtown is not the major business center in that area. The employment in Charleston is almost evenly spread out among downtown, North Charleston, West Ashley, and Mt Pleasant. Just something to consider. Charleston's downtown/peninsula area is, however a great example of why a grid system is more effective than an interstate system. Charleston's downtown handles millions of tourists every year, and there are almost no traffic issues to speak of. You can compare that to Hilton Head, which has one road in and out, and about 1 million tourists a year, and it has nightmarish traffic at all times. ^I would not use Columbia as an example. While it is true about the freeways, they have several major highways running through the city, along with the typical urban renewal, that has had the same effect. I find downtown Columbia, outside of the historic monuments, depressingly mundane and a mind numbing example of how not to build a city. It's a collection of every bad urban concept, including those we see being constructed now in Charlotte, of the last 50 years. I would however put up Greenville, SC as a good example of the right way to do it. I do admit that I am not completely familiar with the freeway system there, but I think Charlotte would have a thing or two to learn from them. All of South Carolina's large cities have an interstate spur or two that dumps traffic into town like 385 in Greenville, but Greenville's freeway system as a whole is a horrible example. Their planning in the high growth areas is non existant, so rather than encouraging the use of both interstate spurs that feed into downtown, all of the traffic is funneled onto 385. More importantly, however, Greenville's downtown, while successful, is not comparable to Charlotte or Raleigh in terms of its size. Thus, the amount of traffic that needs to access downtown Greenville is significantly less than Columbia or Charlotte (which are central to their respective metro areas). Columbia, is a more apt comparison for this discussion as it relates to freeway access and employment density. Just because you don't like the place doesn't mean that it is not successful. Downtown Columbia has several vibrant neighborhoods, the largest CBD in South Carolina, and a vibrant night life and lots of great restaurants in the Vista, 5 Points, and South Main. More importantly, the first-ring street car suburbs have not been cut off from downtown like they are in Charlotte. And the city still functions just fine without the freeway system that Charlotte has. 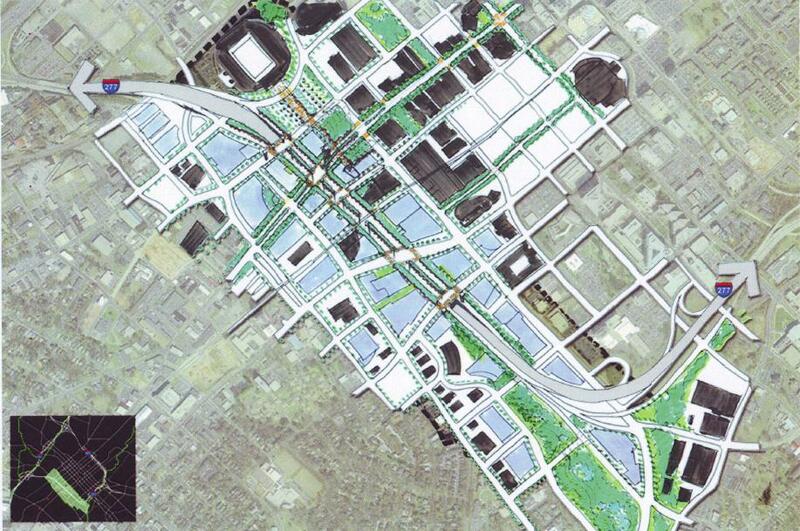 My point in all of this is that not having a downtown freeway will not ruin a city. Having freeway access via an interstate spur seems to be a more viable option. 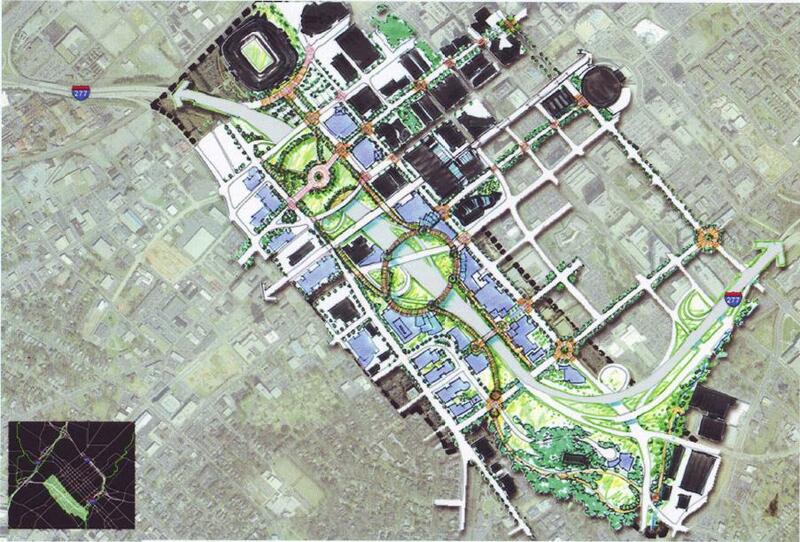 Columbia is the best example, though Greenville, Spartanburg, and Charleston have similar arrangements. ^I would not use Columbia as an example. While it is true about the freeways, they have several major highways running through the city, along with the typical urban renewal, that has had the same effect. Of course there are several major highways running through the city. What city can function in their absence? If you meant to say downtown instead, then that wouldn't be true. As far as urban renewal, there hasn't been anything approaching like what happened when Brooklyn was razed to make room for I-277 in Charlotte. If SC 277 and I-126 were to be connected, as there was talk of doing at one time, then maybe so, but thankfully that didn't happen; if so, it would have destroyed the city's oldest inner ring suburb neighborhood, Elmwood Park. And because I-26, I-20, and I-77 all form a ring around the city, the city and state don't have to waste moeny building an outer loop a la I-485 here in Charlotte. That was pretty forward thinking on SCDOT's part. I find downtown Columbia, outside of the historic monuments, depressingly mundane and a mind numbing example of how not to build a city. It's a collection of every bad urban concept, including those we see being constructed now in Charlotte, of the last 50 years. This is an overexaggeration if there ever was one. Sure there have been some mistakes, the biggest mistake being the razing of some historic storefronts/buildings to make way for monolithic office towers that don't engage the pedestrian at all at street level (which is true to almost every city in the US at one point or another). Other than that, there hasn't been wholesale destruction of neighborhoods without new housing to replace what was lost; no failed urban malls; no center city parks that are rarely utilized due to being surrounded by the wrong set of uses; no big, expansive, empty plazas; etc., so I fail to see how it's gotten everything wrong as you say. I don't want to get too bogged down here, but I do think that Spartan's point still stands. And if you don't think Columbia measures up, you could always uphold Vancouver as an example. But they're pretty different also as a significant chunk of downtown is actually residential in nature. This topics has been dormant for a while, but I thought these photos of the freeway cap in Columbus shows some of what can be done. ^^^ I'm not certain I love the final outcome of the Columbus cap but I do like the absolute transformation. I like the idea of a development cap. Momentum was heading toward that when Ghazi was interested, but it certainly will be hard to justify for a while. I think I like the idea of capping it with a divided city street with a wide median (preferably really wide with a grass median and walking path in it)....the city street would run parallel to 277 on top of it, and could have on-off ramps at the end of the cap, eliminating the current interchanges. Development would occur in the current ROW, but not necessarily over the interstate.....that would be best for combining Uptown and South End in my opinion. I think HNTB presented a similar or identical concept earlier....I'm sure there is a link or image earlier in this thread. 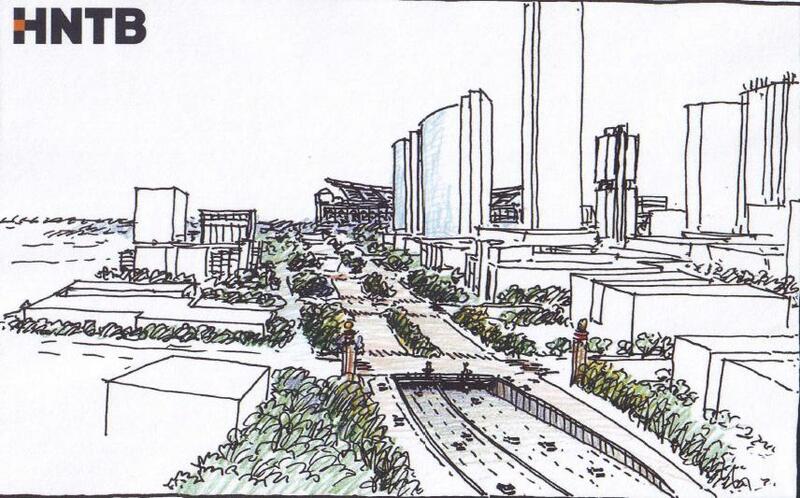 ^With the two-block lid concept either side of Tryon, there already is a street running immediately parallel. It's Hill Street, which runs between Caldwell and Church. 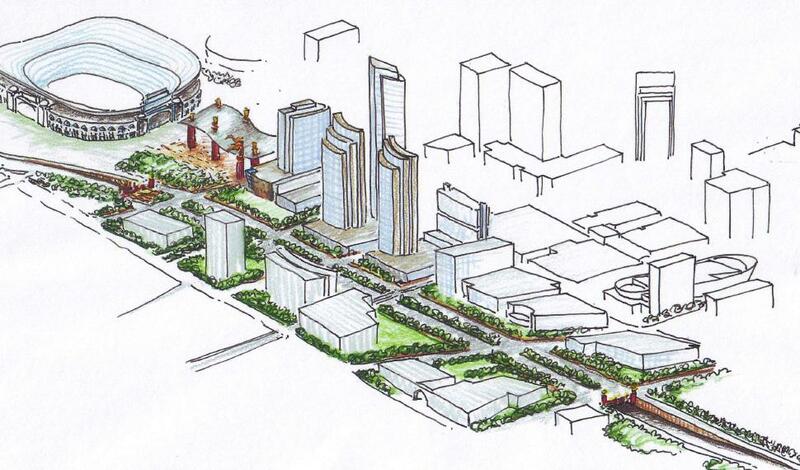 Plus, creating a wide street in the same immediate area as where the City plans to narrow Tryon seems strange to me. Not sure if anyone had noticed, but as I was walking back to my parking lot on Tryon & Morehead, I saw that there were two shallow areas dug on both sides of Tryon St., near the Observer. This kind of coincides with the article they put in Friday's paper about this street being shrunk down to a two lane street to accommodate bicycles and such. Didn't someone post other pictures of pillars or obelisks possibly going on either side of the bridge as a "gateway" into the downtown area? the latter is what's happening right now, at least on the uptown side, i think the southend side sculptures are coming later. and imo, they are pretty poorly-done. hopefully the materials are nice and i'm glad they're trying something like this, but i really, really loathe the design. The south end monuments don't have funding yet, so there is no timeline for installation yet. bump since we mentioned it. The cap isn't really what is being discussed, it is Brookshire being discussed. Unless I'm completely off basis, aren't these the same thing?? Whoa, I had no clue these were two different things. Thanks for the heads up. In other posts, I have advocated keeping Belk with a development cap, but removing Brookshire. Brookshire is the older and more dysfunctional of the two legs of I-277. Rather than do an expensive re-build, I think the traffic impacts of its removal should be studied. Nearly every other city has investigated removing duplicative or branch freeways in their CBD's. Why not Charlotte? So we funded the knight stadium, what's the next big project to tackle? Is it the cap ? 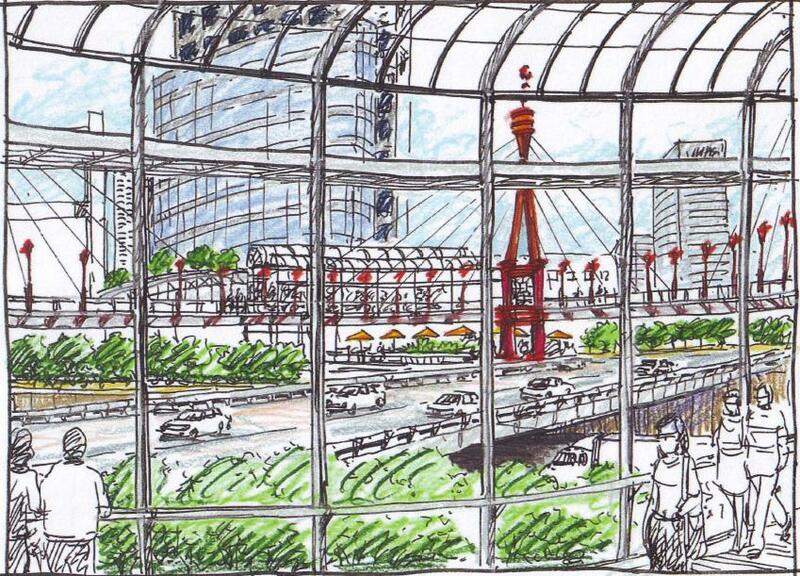 I realize gateway station is on the radar but that is a state/city project. What is the next big city project we pursue? I personally think it should be the cap or fixing the grid in 2nd ward. I don't think the cap will be on anyone's mind for a longtime. Too expensive and not worth it at the moment. I say 15 years from now we revisit the idea when SouthEnd becomes more dense and mature. Also we should tackle it after all these debt talks and try to go for federal dollars. 277 is an interstate. The cap was discussed at the city council meeting last night as part of 277 refurbishment (including reconfiguring the remaining ramps into the more compact style of the South blvd ramp). The price mentioned was $330 million for the cap. Discussion was passed on to the economic development comittee. Didnt realize this but the cap appears to connect directly into the little sugar creek greenway and I have to imagine there would be a connection into the LRT trail. 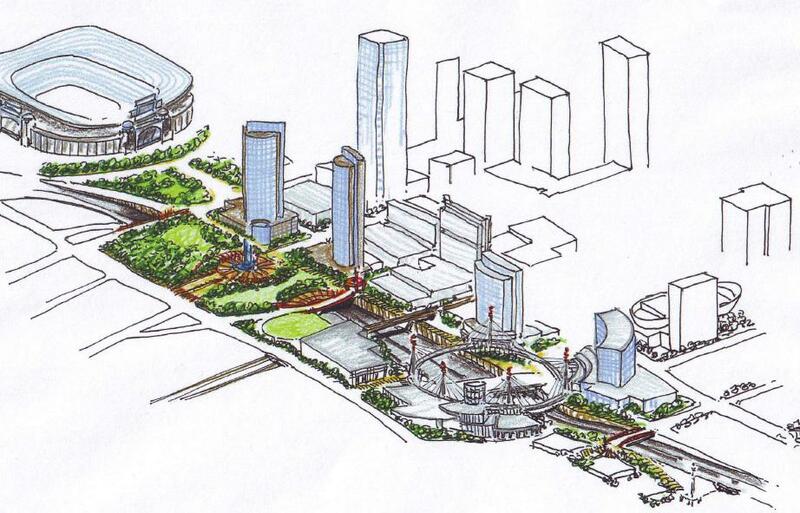 This would be great for connectivity not only from South End but also to the metropolitan complex and Kings drive. The sooner the better! Excellent!